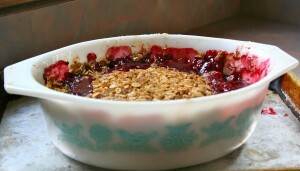 This is a Minnesota classic dessert: rhubarb, berries and lots of brown sugar. I’m a huge fan of crisps. They are quick to put together, endlessly adaptable and feature butter and brown sugar prominently — what’s not to love? Since we are getting toward the end of the rhubarb season and the weather has cooled off, I wanted to use some rhubarb from the garden and pair it with the delicious strawberries I bought from a local grower. My rhubarb is very red and very tart, so I paired it with two kinds of berries for a delicious dessert. Topping: Melt 3 TBSP butter and mix with 1 cup oats, 1/2 cup brown sugar, 3 TBSP flour and 3 TBSP ground flax seed. (The flax is totally optional, but I used it. You could replace it with wheat germ or a bit more flour.) Mix together, then add salt to taste and 1 tsp cinnamon. Mix, then place on top of the fruit, pressing down on the topping with the back of a spoon so it’s not too crumbly. Bake in a 350 degree oven for about 1 hour. When the fruit juices are slowly bubbling, it’s done. Let it cool and enjoy with whipped cream, ice cream or have it with yogurt for breakfast!